AviTracks-DM makes it easy to improve the quality of care for high-risk patients, enhance information flow within and outside your clinic, and manage two to three times the number of patients without increasing staff levels. 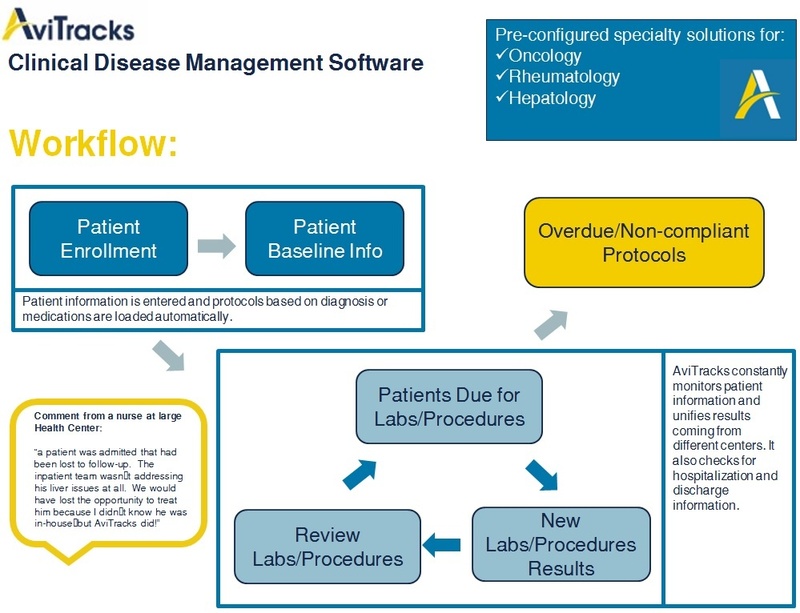 With automated workflow and real time EMR and lab interfaces, AviTracks-DM automatically updates the status of each one of your patients – including pending labs, labs waiting to be reviewed, critical alerts and reminders for follow up. Built-in and customizable reports create the documentation you need to comply with quality initiatives and pay-for-performance measures. EMRs are typically used to record encounter notes and generate billing data, but are often inadequate when it comes to clinical disease management plans – especially for patients with multiple chronic conditions and complex therapies. AviTracks-DM fills this gap by integrating with your current EMR and laboratory systems so you can create custom protocols, treatment plans and alerts tailored to each individual patient – while leveraging and sharing patient data already housed within your EMR.